Not to be confused with Francis II, Holy Roman Emperor, later styled Francis I as Emperor of Austria. Francis was born in Nancy, Lorraine (now in France), the oldest surviving son of Leopold, Duke of Lorraine, and his wife Princess Élisabeth Charlotte d'Orléans. He was connected with the Habsburgs through his grandmother Eleonore, daughter of Emperor Ferdinand III. He was very close to his brother Charles and sister Anne Charlotte. Emperor Charles VI favoured the family, who, besides being his cousins, had served the house of Austria with distinction. He had designed to marry his daughter Maria Theresa to Francis' older brother Leopold Clement. On Leopold Clement's death, Charles adopted the younger brother as his future son-in-law. Francis was brought up in Vienna with Maria Theresa with the understanding that they were to be married, and a real affection arose between them. At the age of 15, when he was brought to Vienna, he was established in the Silesian Duchy of Teschen, which had been mediatised and granted to his father by the emperor in 1722. Francis succeeded his father as Duke of Lorraine in 1729. In 1731 he was initiated into freemasonry (Grand Lodge of England) by John Theophilus Desaguliers at a specially convened lodge in The Hague at the house of the British Ambassador, Philip Stanhope, 4th Earl of Chesterfield. During a subsequent visit to England, Francis was made a Master Mason at another specially convened lodge at Houghton Hall, the Norfolk estate of British Prime Minister Robert Walpole. Maria Theresa arranged for Francis to become "Lord Lieutenant" (locumtenens) of Hungary in 1732. He was not excited about this position, but Maria Theresa wanted him closer to her. In June 1732 he agreed to go to Pressburg. When the War of the Polish Succession broke out in 1733, France used it as an opportunity to seize Lorraine, since France's prime minister, Cardinal Fleury, was concerned that, as a Habsburg possession, it would bring Austrian power too close to France. A preliminary peace was concluded in October 1735 and ratified in the Treaty of Vienna in November 1738. 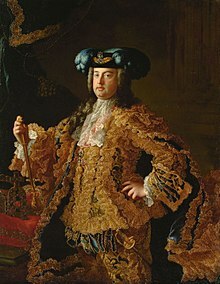 Under its terms, Stanisław I, the father-in-law of King Louis XV and the losing claimant to the Polish throne, received Lorraine, while Francis, in compensation for his loss, was made heir to the Grand Duchy of Tuscany, which he would inherit in 1737. Although fighting stopped after the preliminary peace, the final peace settlement had to wait until the death of the last Medici Grand Duke of Tuscany, Gian Gastone de' Medici in 1737, to allow the territorial exchanges provided for by the peace settlement to go into effect. In March 1736 the Emperor persuaded Francis, his future son-in-law, to secretly exchange Lorraine for the Grand Duchy of Tuscany. France had demanded that Maria Theresa's fiancé surrender his ancestral Duchy of Lorraine to accommodate the deposed King of Poland. The Emperor considered other possibilities (such as marrying her to the future Charles III of Spain) before announcing the engagement of the couple. If something were to go wrong, Francis would become governor of the Austrian Netherlands. Elisabeth of Parma had also wanted the Grand Duchy of Tuscany for her son Charles III of Spain; Gian Gastone de' Medici was childless and was related to Elisabeth via her great-grandmother Margherita de' Medici. As a result, Elisabeth's sons could claim by right of being a descendant of Margherita. On 31 January 1736 Francis agreed to marry Maria Theresa. He hesitated three times (and laid down the feather before signing). Especially his mother Élisabeth Charlotte d'Orléans and his brother Prince Charles Alexander of Lorraine were against the loss of Lorraine. On 1 February, Maria Theresa sent Francis a letter: she would withdraw from her future reign, when a male successor for her father appeared. They married on 12 February in the Augustinian Church, Vienna. The wedding was held on 14 February 1736. The (secret) treaty between the Emperor and Francis was signed on 4 May 1736. In January 1737, the Spanish troops withdrew from Tuscany, and were replaced by 6,000 Austrians. On 24 January 1737 Francis received Tuscany from his father-in-law. Until then, Maria Theresa was Duchess of Lorraine. Gian Gastone de' Medici, who died on 9 July 1737, was the second cousin of Francis (Gian Gastone and Francis' father Leopold were both great-grandchildren of Francis II, Duke of Lorraine), who also had Medici blood through his maternal great-great-grandmother Marie de' Medici, Queen consort of France and Navarre. In June 1737 Francis went to Hungary again to fight against the Turks. In October 1738 he was back in Vienna. On 17 December 1738 the couple travelled south, accompanied by his brother Charles to visit Florence for three months. They arrived on 20 January 1739. In 1744 Francis' brother Charles married a younger sister of Maria Theresa, Archduchess Maria Anna of Austria. In 1744 Charles became governor of the Austrian Netherlands, a post he held until his death in 1780. Maria Theresa secured in the Treaty of Füssen his election to the Empire on 13 September 1745, in succession to Charles VII, and she made him co-regent of her hereditary dominions. Francis was well content to leave the wielding of power to his able wife. He had a natural fund of good sense and brilliant business capacity and was a useful assistant to Maria Theresa in the laborious task of governing the complicated Austrian dominions, but he was not active in politics or diplomacy. However, his wife left him in charge of the financial affairs, which he managed well until his death. Heavily indebted and on the verge of bankruptcy at the end of the Seven Years' War, the Austrian Empire was in a better financial condition than France or England in the 1780s. He also took a great interest in the natural sciences. He was a member of the Freemasons. Francis was a serial adulterer, many of his affairs well-known and indiscreet, notably one with Maria Wilhelmina, Princess of Auersperg, who was thirty years his junior. This particular affair was remarked upon in the letters and journals of visitors to the court and in those of his children. He died suddenly in his carriage while returning from the opera at Innsbruck on 18 August 1765. He is buried in tomb number 55 in the Imperial Crypt in Vienna. Maria Theresa and Francis I had sixteen children, amongst them the last pre-revolutionary queen consort of France, their youngest daughter, Marie Antoinette (1755–1793). Francis was succeeded as Emperor by his eldest son, Joseph II, and as Grand Duke of Tuscany by his younger son, Peter Leopold (later Emperor Leopold II). Maria Theresa retained the government of her dominions until her own death in 1780. 8 Archduchess Maria Amalia of Austria 26 February 1746 9 June 1804 married Ferdinand, Duke of Parma (1751–1802), had issue. 9 Holy Roman Emperor Leopold II 5 May 1747 1 March 1792 married Infanta Maria Luisa of Spain (1745–1792), had issue. Grand Duke of Tuscany from 1765 (abdicated 1790), Holy Roman Emperor from 1790, Archduke of Austria, King of Hungary and King of Bohemia from 1790. 14 Archduke Ferdinand of Austria 1 June 1754 24 December 1806 married Maria Beatrice d'Este, Duchess of Massa, heiress of Breisgau and of Modena, had issue (Austria-Este). Duke of Breisgau from 1803. 15 Archduchess Maria Antonia of Austria 2 November 1755 16 October 1793 married Louis XVI of France and Navarre (1754–1793) and became Marie Antoinette, Queen of France and Navarre. 16 Archduke Maximilian Franz of Austria 8 December 1756 27 July 1801 Archbishop-Elector of Cologne, 1784. Francis I, by the grace of God elected Holy Roman Emperor, forever August, King in Germany and of Jerusalem, Archduke of Austria, Duke of Lorraine, Bar, and Grand Duke of Tuscany, Duke of Calabria, in Silesia of Teschen, Prince of Charleville, Margrave of Pont-à-Mousson and Nomeny, Count of Provence, Vaudémont, Blâmont, Zütphen, Saarwerden, Salm, Falkenstein, etc. etc. ^ Hale, Florence and the Medici, Orion books, p 192. London, 1977, ISBN 1-84212-456-0. ^ Maria Theresia und ihre Zeit. Exhibition from 13 May till October 1980 in Vienna, Schloss Schönbrunn, p. 28, see also pp. 37, 38, 41, 47, 52, 53 for the other details described here. ^ "In Mozart's Vienna, Freemasonry had flourished under the Habsburgs mainly due to the influence of Francis Stephen, Duke of Lorraine, who, himself, was a Freemason." Wolfgang Amedeus Mozart – Master Mason Archived 13 November 2007 at the Wayback Machine. ^ Farquhar, Michael (2001). A Treasure of Royal Scandals, p.89. Penguin Books, New York. ISBN 0-7394-2025-9. ^ Genealogie ascendante jusqu'au quatrieme degre inclusivement de tous les Rois et Princes de maisons souveraines de l'Europe actuellement vivans [Genealogy up to the fourth degree inclusive of all the Kings and Princes of sovereign houses of Europe currently living] (in French). Bourdeaux: Frederic Guillaume Birnstiel. 1768. p. 81. This article incorporates text from a publication now in the public domain: Chisholm, Hugh, ed. (1911). "Francis I. (emperor)" . Encyclopædia Britannica. 10 (11th ed.). Cambridge University Press. p. 933.